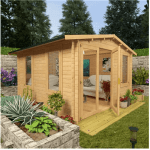 The 7 x 5 Burford Summerhouse is a very classy and charming looking small summer house that is perfect for those who want a little space to relax in the garden. 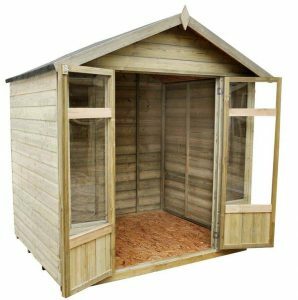 Ideal for those who lack a large garden, this compact sized summerhouse with its smart design is going to be a stand out feature. The large double doors have a great set of windows on them. These are joined by another two which make the front of the summerhouse have a very welcoming and friendly design. 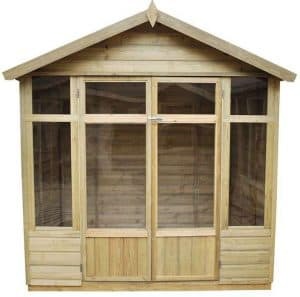 Those who want a summerhouse to be a positive feature in their garden are going to just love the way this looks. 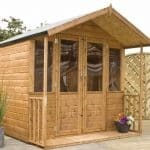 Even though this is a summerhouse that is a little on the small size, it is still a very robust and long lasting structure. The wood they have used is pressure treated so it is low maintenance and will last many, many years. Tongue and groove shiplap cladding which is an impressive 12 mm thick is joined with a solid frame to really make sure this is a summerhouse that is going to last 20 or more years. A lot of time and effort has gone into making sure that this is going to be something that you can have fun with for a very long time. 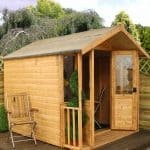 The 7 x 5 Burford Summerhouse is a charming small summer house that is certainly very easy on the eyes. We know that some of you may take one look at that price tag and then hightail it out of there, but if you keep reading you will see that this is a summerhouse that is a little more high quality than you would usually get at this size. Now as this is a compact summerhouse, you are going to have to work with the space you have and really make it go as far as possible. The depth is 4 feet 11 inches and the width is 6 feet 8 inches so some careful planning will be needed to ensure that this space goes along way. 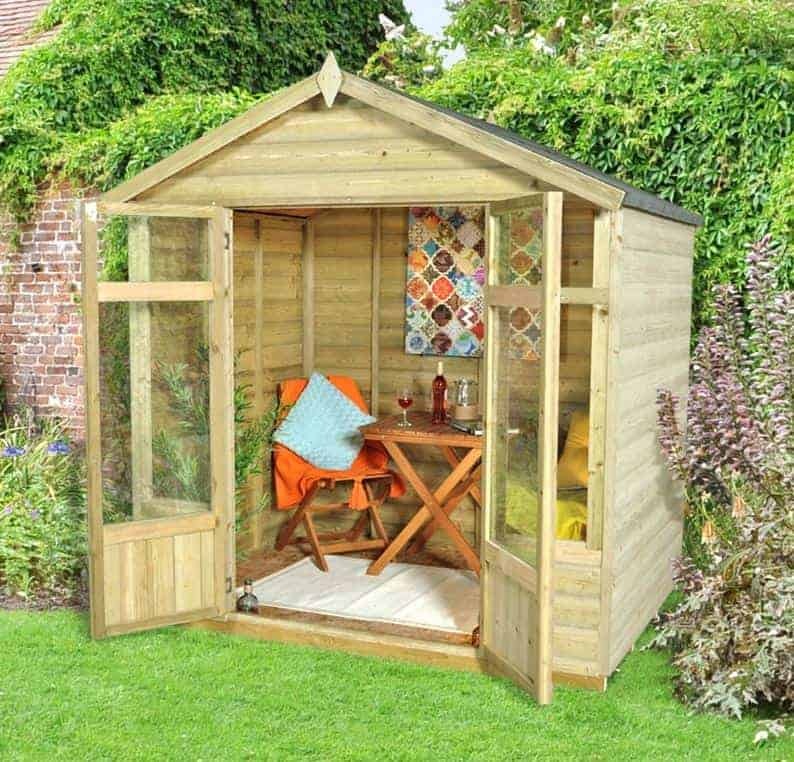 The compact nature of this summerhouse does mean that even gardens that are a little low on space can enjoy it. The headroom this summerhouse provides is quite impressive as along the ridge you have 7 feet 4 inches of headroom. So right along the middle of the summerhouse, you have a lot of height. The eaves are 5 feet 9 inches high, which we know does not sound like much, but this is right about what we would expect from a summerhouse like this. The roof of this small summer house has a real traditional look to it. We actually think this is very smart looking and gives the summerhouse some class. The roof is made with 8 mm thick solid sheet boarding and then covered with black sand felt. Could they have used some nicer looking boarding for the roof? On one hand, we really would have liked to have seen some tongue and groove boarding used for the roof, but then that would have increased the price and to be fair, 8 mm thick solid sheet boarding is going to be able to handle whatever the elements throw its way. We mentioned earlier about how the 7 x 5 Burford Summerhouse is a little bit more high quality than other summerhouses of a similar size. Well part of that is the cladding they have used. The cladding looks incredible. It has a smooth and high quality look to it and that is because it is made with 12 mm thick tongue and groove shiplap cladding. This is some of the best cladding you can get as it does not allow any way for water to get inside. Plus it is also very thick so it is impressively strong as well. Inside here we have a 28 mm x 28 frame which we feel for a small summer house is just perfect. This kind of frame makes the whole structure very robust, but as you can see from the pictures it does not take up a whole lot of space. The frame along with the 12 mm thick cladding is going to ensure that the whole structure stays firm for many, many years. Now clearly this is supposed to be a summerhouse that is a little bit more upmarket than your regular smaller sized summer house, but one area that we do feel they could have improved on was the floor. They have used the same 8 mm thick solid sheet boarding for the roof and while this does the job and does it well, we do feel at this price range some tongue and groove boarding would have looked much better. 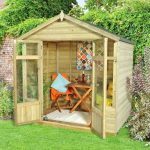 The 7 x 5 Burford Summerhouse comes to you pressure treated so you do not have to worry about getting the wood treatment out right away and giving it a coating. Of course doing so would not cause any harm so feel free to if you want to be extra cautious, but the fact the timber has been pressure treated is one of the main reasons as to why this small summer house is priced the way it is. 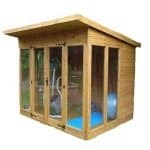 You get a very impressive 15 year guarantee with this summerhouse. They are able to give such a generous guarantee because of the pressure treatment process the wood has gone through. Even though this is a compact sized summerhouse they have still managed to fit on there a set of awesome looking double doors. We really like the design of the doors they have gone for. They are mainly made with styrene windows, but there is some sharp looking vertical cladding along the bottom of them. These doors when both open give you a lot of room to get in and out. 3 feet 9 inches of width and 5 feet 5 inches of height will make getting in and out very easy, even when you have had a few too many glasses of wine. On the front of this small summer house as well as the large windows on the doors there is also a good sized window on each side of the door. This means light is really going to flood into the summerhouse. The windows from a design point of view look amazing. They are done in the same style as the ones on the door, but they are just that little bit narrower which really helps give the front of the summerhouse a lot of personality. Like the windows on the doors, styrene has been used. This is ideal if you have kids playing in the garden as there is no danger of there being broken glass. If you look real closely at those from doors, you can see that there is a good sized pad bolt for you to keep the doors closed. There is no lock included with this, but adding a padlock is cheap and easy. 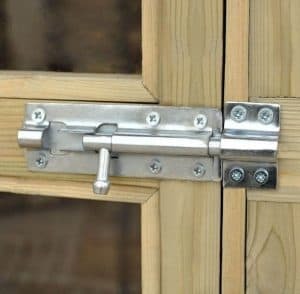 While this is effective in keeping the doors securely closed, we do feel a proper lock and key would have looked better. The amount of privacy you get with the 7 x 5 Burford Summerhouse all depends on where you put it in your garden. The front is very exposed, but there are no windows on the sides or the back so you could position it in a way so that no nosey neighbours can look inside. They are not actually offering you any customisation options with this small summer house. Of course the biggest thing you could do is add a bit of colour to it which while not actually needed, would make that pressure treated wood even more well equipped for fighting off the 10 months of winter weather we get in the UK. They do have a few extras listed with the 7 x 5 Burford Summerhouse. First thing they have is a Shed Solar Light which at £11.69 is fairly cheap way to add a little light in the summerhouse if you want to take in the evening and enjoy a nice drink. They also have two Shed Base Kits. A wooden one that costs £45.98, and a plastic one priced at £84.99. These are for those of you who have some concerns about the area you are installing the summerhouse on. We love how this is made with pressure treated wood and in general it is a very high quality summerhouse, but had they used tongue and groove boarding for the floor, we would have scored this at least a 9! You are going to get many years of use out of this. The pressure treated wood along with the style of cladding and the thick frame really will ensure this. Also it will not require all that much TLC from you in order to keep it free from rot and decay. As is the case with all 7 x 5 summerhouses, you are going to have to plan things out carefully in order to make sure you get as much out of the space in front of you as possible. We do not even see novice DIY’ers having too much trouble with this. Just be sure to have a friend you can boss around to help out and this will be up and ready for drinks in no time at all. We would have liked to have scored this a bit higher, but this is one of the pricier compact sized summerhouses we have seen. At this price, we do feel they could have put a more high quality floor in here. Final Thoughts: The 7 x 5 Burford Summerhouse is one very charming and easy on the eyes, small summer house. We are sure that some people are going to be sold as soon as they see the first picture and to be honest we very nearly were. This is a summerhouse that does so many things right. The pressure treated wood, the tongue and groove shiplap cladding and the strong frame being the main ones. But as much as we hate to keep harping on about it, we must say that we feel at this price a better looking flooring should have been used. Still if you can get past or perhaps even add some kind of rug, then we are sure you will be very happy with this.